As January drew to a close, I couldn’t help but to think back 20 years, to the end of January 1998, the month my book, The Rhythm of Business: The Key to Building and Running Successful Companies was first published. It describes the natural development process successful entrepreneurs use to build and run their businesses. In metaphor and in reality, successful entrepreneurs feel the rhythm of their business. When they do, they know what they need to learn about their customers, the partner ecosystem, and the business model that will create, deliver, and capture value for all concerned. That focus on “getting smart quickly” lets them operate with necessary speed and the agility to adjust with quick, easy grace as they learn what enables their success. Speed and agility are certainly much discussed today, by both entrepreneurs and business people in large enterprises, so I decided to take a fresh look at what I wrote over 20 years ago to reflect on its relevance today. Never stop the dance with the customer because customers drive business and create its basic rhythm. To be successful in business today you must see your customers as individuals, not as part of a mass market of faceless people. A company should engage in only those activities in which it has a key skill/core competency. Structuring the business around its core competencies and entering into alliances with other companies for all other needs is a strategy that allows for great flexibility. Develop long term relationships rather than pursue one-time transactions. Attempting to develop a product and/or service that fulfills a customer’s needs, testing that solution in the marketplace, learning from that test, and then refining the solution to more accurately satisfy the customer’s needs—and doing this again and again and again is what it takes to achieve and maintain success. You need to equip your business with the latest and best technologies as well as the fastest design and production facilities, so you can gather and process information quickly and take advantage of the opportunities you see. Failure is an integral part of achieving success. No path to failure is more direct than a “final” decision because final means no more information. Success requires the ability to get smart quickly about customer needs and the appropriate business model that satisfies those needs better than any other company. In Washington Irving's story, Rip van Winkle fell asleep and woke up twenty years later, having missed the American Revolution, the death of his wife, the marriage of his daughter, and the birth of his grandson. If, instead, he’d gone to sleep in 1998 and woke up this morning, he would have missed the fundamental transformation from the 20th century’s understanding of how to achieve success in business to the 21st century’s business environment in which resiliency, agility, and the courage to be bold and think differently are essential in the face of ever-changing market dynamics. Decisions have to be made quickly and with incomplete information in a constantly changing environment where customers are in control; access is more important than ownership; products are commodities; the experience is paramount; and any advantage is fleeting. Savvy business people know the pace of business only continues to increase. They are also keenly aware that sometimes one has to move slowly in order to then move fast. You need to ensure you have the capability to learn about your customers, the partner ecosystem, and business model in order to develop the agility to move and adapt with quick easy grace. Just as a Formula One race car driver can hit 200 mph on a straight away, he or she can feel when they need to slow down and when they can put the pedal to the metal—successful executives have to develop that same ability. That is, as I wrote in 1998, you need to feel the rhythm of your business. 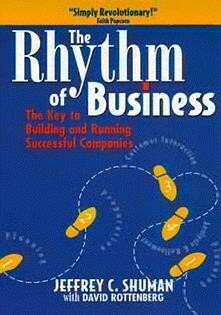 The Rhythm of Business: The Key to Building and Running and Running Successful Companies, with David Rottenberg, Butterworth Heinemann, 1998. Rip Van Winkle, short story by Washington Irving, published in The Sketch Book in 1819–20. Organizing for the age of uncertainty, Aaron De Smet and Chris Gagnon, McKinsey Quarterly, McKinsey& Company, January 2018.